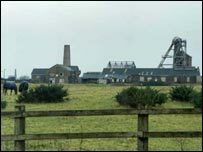 A developer has taken the battle to reopen a former tin mine in Cornwall to the High Court in London. A government-backed regeneration agency has plans to build houses, offices and leisure facilities at South Crofty mine near Pool. But Crofty Developments said the mine could be reopened as a commercial venture and as a heritage centre. South Crofty, the last working tin mine in Europe, was closed in 1998, ending 3,000 years of tin mining in Cornwall. The South West Regional Development Agency (RDA) said last year it would compulsorily purchase the former mine for leisure, industrial and housing use. The RDA and other regeneration agencies including the Camborne, Pool and Redruth Urban Regeneration Company (URC) suggested tin mining was not the sort of industry a modern county needed. The RDA said its plans would create up to 2,000 new jobs and 600 new homes. But Crofty Developments has accused the URC of being involved in the preparation of a local strategic plan and preventing an independent decision on the site by the local council. Timothy Straker QC, for Crofty Developments, said: "The whole thing is dreadfully unfair." Kerrier Council, the URC, and the RDA, deny there was any impropriety in the preparation of the local plan and that, as it is not due to be adopted until 2009 at the earliest the challenge by Crofty Developments is "premature". Judge David Mole will decide whether to grant Crofty Developments permission to launch a judicial review later this week.